Deetay had an inseparable bond with his owner, they did everything together. After his owner, Gabriel, retired, the former soldier had always had his eye on getting a dog, a small one to keep him company when the days were quiet. He found Deetay as a pup in a shelter, and took him home, treating him like his best friend. When Gabriel unfortunately passed away, Deetay lost someone huge in his life. Now every time Gabriel’s daughter visits her father, she takes his beloved dog with her, and he does nothing but cuddle up next to the gravestone, without ever wanting to move. 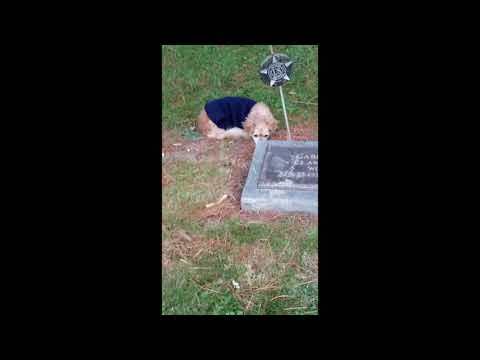 There are many dog who exhibit similar behaviour after their owners have passed away, some how understand the significance of the gravestone and knowing that they’re as close as they can be to their owner. It’s sad to see how much Deetay misses his owner, it goes to show a dog really is a man’s best friend.